If you've ever wished for a Best Hiking Tips expert to answer your questions about how to hike, you've hit the hiking jackpot! How do I start hiking? What are the best womens hiking clothes? Do I have the right hiking gear like sleeping bag and hiking boots? What should I know to keep myself safe on the trail? How do I plan for my first hike? What can I do to reduce my hiking aches and pains after a long day on the trail? Should I be using trekking poles? What should be on my backpacking list? Can I use my cell phone for navigation? Do I carry the same water bottle in every season? Is it safe to hike solo? What kind of sun protection is best for female hikers? Do uphill hikers have the right of way? Can I put together my own basic first aid kit? Backpacking food ideas - where do I even start? Can I pull off a Pacific Crest Trail or Appalachian Trail backpacking trip? Grab a comfy chair and your favorite beverage! This is the place to get your questions answered so you can stay on the trail - or get on it the very first time. 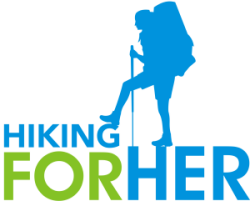 Hiking For Her offers a bounty of free how to hike advice and information geared toward women hikers. Because we do things a little differently than the guys! Is this a female hiking blog? A how to hike guide? Or an archive of hiking knowledge? Use the information on Hiking For Her any way you'd like! Which types of hiking appeal to you? It's easy to keep the newest hiking advice flowing your way! A free monthly Happy Trails newsletter, delivered in the last week of each month, year round. Use the form at the top of the page. Fifty two weekly updates per year, brimming with time sensitive freebies, coupons, deals, and hiking resources: the sign up is at the bottom of the page. Lots of tips, news, offers and fun stuff that you won't see anywhere else! And rest assured, your address is used only to send you this hiking related information. It's never sold or shared. 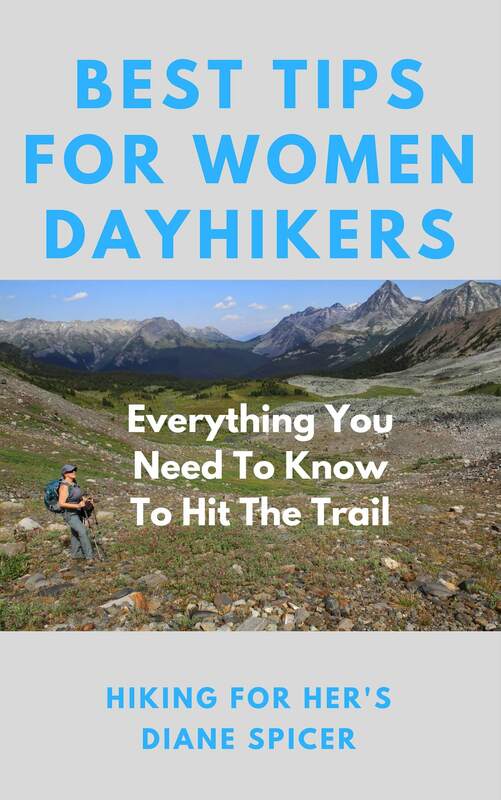 For women day hikers, here's a wonderful way to get answers to your hiking questions: a good old fashioned book! Click the cover to see the book's content. This book is packed full of practical advice, plus tips to keep you safe and happy on any hiking trail. Available as an e-book (Kindle) or paperback! Our Over Forty Hiker Community is a private, focused group where you can exchange ideas and hiking information with other female hikers. Scroll through this handy site map. It's conveniently organized by hiking topic. Or use the green highlighted search box at the top of each page to search for a topic. Use the floating "top" button on the right side of your screen to get there fast. Get your individual questions answered by me, a trail veteran with 45+ years (and counting) of hiking experience. Every email is read and answered, free of charge. 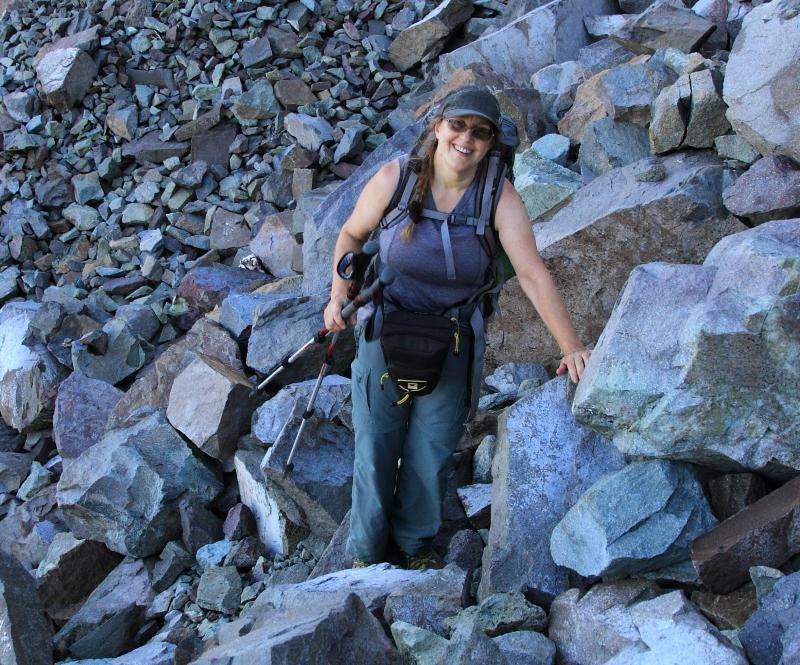 Because if you have a hiking question, chances are lots of other women hikers do, too. When you ask, the answers are incorporated into this website. Your questions reassure other female hikers that nothing is too small or insignificant to ask about. Asking your question builds a strong community of strong women on the trail. Hurrah For Hikers! This CONTACT link gets you started. Let's spread the wealth of best hiking tips for women hikers far and wide! Together, we're stronger, smarter and safer hikers on the trail. "Who would sit down and write all this stuff about hiking?" And enter for a chance to win something you can use on your next hike. There's a free e-course for you, too. It's a pleasure creating this hiking resource for women hikers, so please enjoy every page. and hike up a storm! Poor choice of words for a hiker. Stride confidently down any trail, in any weather, using these best hiking tips from your virtual trail buddy at Hiking For Her. Photo credits: All photos on this website were taken by David Midkiff or Diane Spicer. All rights reserved.